ABC officially cancelled the George Lopez sitcom today after six seasons. Rumors had been flying for some time — either that the series would be certainly cancelled or definitely renewed. How does series star Lopez feel about the cancellation? He reportedly received a call over the weekend from ABC Entertainment President Stephen McPherson who told him the news — that another season of George Lopez wouldn’t work out financially because the network would lose money. Admittedly, the series has been down in the ratings but this has been due, at least in part, to ABC’s actions. The network has switched the series’ timeslot several times over the years and has put it opposite ratings powerhouse American Idol many times this season. 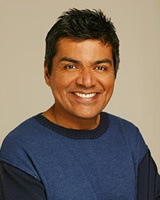 Though many viewers have complained that the series had run its course, George Lopez has proven to be a reliable quick fix when the network had a schedule hole to fill. The sitcom consistently out-performed other sitcoms in similar timeslots — including Notes from the Underbelly, which incidentally has been renewed for next year. Lopez believes the cancellation is due in part to the fact that Warner Bros. Television produces his series rather than ABC Television Studios. Some of ABC’s new series, like the one based on the Geiko cavemen commercials, are produced in-house. George Lopez conplains about how his show was cancelled, but yet he has no problem firing people in the same manner. He got rid of Masiela Lusha with no problem. For no reason. He could not compromise with Lusha. All the networks are showing trash. I wiuld rather watch The George Lopez show over any trashy reality show.